>As promised I will be providing everyone with interactive white board resources. I have organized a number of resources on my wiki . There you will find resources and training materials for all grade levels. In this posting I would like to highlight one resource in particular. It can be found here http://www.bgfl.org/bgfl/15.cfm?s=15. 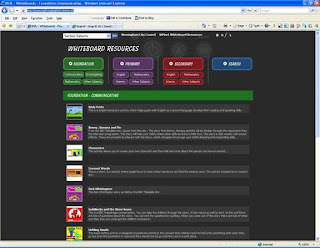 This site contains a listing of interactive sites organized by grade level and subject. They can be used on both a smart and intelliboard interactive board.